Rachel Scott was just eight when her father, Pastor Darrell Scott, walked out on her mother, Beth, leaving her with five children. A year later Rachel’s grandparents helped her mom move to Littleton, Colorado, and buy a home. When Rachel was twelve, she had a life-changing spiritual encounter. She later wrote in her journal, “Everyone was there at the altar, and I felt so drawn to it. You have to understand that I was so young…to be drawn that way, it was nothing short of God…That night I accepted Jesus into my heart. I was saved.” From that time on her family saw a spiritual depth beginning to develop in Rachel. Two years later Rachel’s mother remarried. During this difficult adjustment Rachel became increasingly withdrawn and private. When she was sixteen, her mother gave her a journal, the first of many. Rachel began to chronicle her spiritual journey and commitment to Christ—a commitment that cost her deeply. She broke up with the boy she loved in order to keep herself chaste and later was rejected by five of her closest friends for talking openly about her faith. On April 20, 1998, one year to the day before she died, she wrote these words: “I have no personal friends at school. But you know what…it’s all worth it to me…If I have to sacrifice everything I will.” Rachel had no idea of the sacrifice she would ultimately make (Rachel’s last school picture on left). On April 20, 1999, Rachel sat outside the cafeteria when two troubled students armed with guns came up the stairs at Columbine High School. They opened fire, hitting three times. After leaving to find more victims, they returned to where Rachel lay crying in pain. One of them lifted her head by her ponytail and jeered, “Do you believe in God?” She answered, “Yes.” He put the gun to her temple and killed her. Her father had no idea what the dream could mean. Several days later he picked up Rachel’s backpack from the sheriff’s office. Inside were two journals, one with a bullet hole through it. He turned to the last page of her most recent diary and was dumbfounded to see a drawing of her eyes with a stream of thirteen tears watering a rose. The tears appeared to turn into drops of blood as they touched the rose. The number of tears matched the number of victims at Columbine. It practically took his breath away to see in Rachel’s final diary exactly what the stranger had described to him a week earlier. Looking in previous diaries, her parents discovered that same rose drawn a year before Rachel’s death. 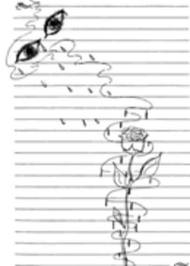 The earlier drawing simply showed the rose with the blood like drops, not her eyes or the clear tears, and it showed the rose growing up out of a columbine plant, the state flower from which Columbine High School got its name (Rachel’s drawing on the right). Rachel’s diaries reveal the heart of a young woman who loved her Lord. When the time came to put her faith on the line, she was prepared to pay the ultimate sacrifice. Are you willing to put your faith on the line and speak out boldly of your Savior? If we follow Rachel’s example of committing ourselves completely to Christ, we too will be willing to sacrifice all if called upon to do so. “If you try to keep your life for yourself, you will lose it. Author’s of the Article Above: Mike and Sharon Rusten are not only marriage and business partners; they also share a love for history. Mike studied at Princeton (B.A. ), the University of Minnesota (M.A. ), Westminster Theological Seminary (M.Div. ), Trinity Evangelical Divinity School (Th.M. ), and New York University (Ph.D.). Sharon studied at Beaver College, Lake Forest College, and the University of Minnesota (B.A. ), and together with Mike has attended the American Institute of Holy Land Studies (now Jerusalem University College). The Rustens have two grown children and live in Minnetonka, Minnesota. 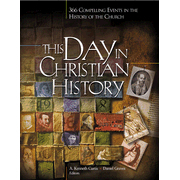 This article was adapted from the April 20th entry in their wonderful book The One Year Book of Christian History, Carol Stream, IL: Tyndale, 2003. For More About Rachel Scott: If you would like to know the whole story about Rachel see Darrell Scott and Beth Nimmo. Rachel’s Tears: The Spiritual Journey of Columbine Martyr Rachel Scott. Nashville: Nelson, 2009, 10th Anniversary edition. For More About Columbine’s Cultural & Spiritual Ramifications: see Wendy Murray Zoba. Day of Reckoning: Columbine and the Search for America’s Soul. Grand Rapids: Baker, 2000. 1500: Pedro Cabral took possession of Brazil for Portugal with religious ceremonies this Easter Monday. 1558: Johannes Bugenhagen, a coworker of Martin Luther’s, professor at Wittenburg and key reformer, died on this day. He helped Luther translate the Bible into German and did another translation into Low German. 1884: Leo XIII issued the encyclical Humanum Genus against the Masoni order. 1946: The Lutheran bishops’ conference of the United Evangelical Lutheran Church in Germany issued a protest to the Communist government against ongoing persecution. 1999: At a Colorado school, several children were killed by classmates in an incident known as the Columbine shooting. Among those killed was Rachel Scott, a Christian girl who answered “yes” when asked point-blank if she believed in God (see article above). Pingback: School of Doubt | High School Assemblies, Rife with Prayers and Other Assorted Woo? What a powerful account of the Holy Spirit at work in a young girl’s life! What a great article you’ve written on Rachel. She was just a normal girl with normal struggles. But she had such faith. She walked with Jesus and showed radical compassion to the kids that everyone else ignored. I’m got an exciting announcement! WE’RE MAKING A MOVIE ON RACHEL’S STORY on behalf of her mother Beth. It’s called I’m Not Ashamed. We’re releasing it on April 20, 2016, the 17 anniversary of Columbine and the death of a 17 year old girl who was not ashamed to share her faith in Jesus, even to her killers. We’re so excited! Check out our video!